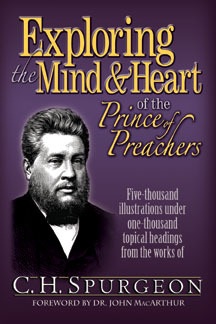 Exploring the Mind and Heart of the Prince of Preachers is a compendium of over 5,000 illustrations and anecdotes sorted under more than 1,000 topical headings drawn from the sermons and writings of the most prolific Christian writer of all time. The book is comprised of two sections, one of general use and interest and a second geared primarily to those in ministry. Please allow me to quote extensively from the book’s introduction to help you understand its contents and purpose. Years ago, like most preachers, when asked if they like Spurgeon, I would have said “yes” in spite of having read very little of him. Down through the years I had read a few of the “Twelve Sermons” series on various topics, but that was about it. In 1997, I bought one of the entire volumes of sermons published by Pilgrim Publications and was absolutely in awe. I devoured it quickly and immediately bought another, and then another. Soon I found myself in possession of the entire set and began a systematic process of reading the entire set over the next seven or so years. My only regret is not having started sooner. Every attempt has been made to retain strict adherence to the original words of Spurgeon, without alteration. Many editors and publishers “conveniently” sanitize Spurgeon without any reference to this fact. For example, an examination of a reprint of Spurgeon’s devotional classic Morning and Evening revealed that a negative comment Spurgeon had made about Catholicism had been excised, without any mention of the fact. In preparation for this volume, I was reading John Ploughman’s Talk, reprinted by a publisher other than Pilgrim Publications. In reading it, I had a feeling I was reading an altered version, and so I obtained an original reprint. Sure enough, there were not only deletions from what Spurgeon had originally said, but actual additions, even complete sentences that had crept in! Another reprint of Words of Advice for Seekers was missing entire chapters revealed by a comparison to a Passmore original. The bulk of the extracts contained in this volume have been gleaned from the complete sixty-three volume set of Spurgeon’s sermons, originally printed by Passmore and Alabaster and more currently reprinted by Pilgrim Publications. In the event the reader desires to locate a particular quote, I am attempting to make it as easy as possible to find it. The problem is that now that the sermons are available in digital formats via the Internet and CD’s, the page numbers are usually different in these media than the original volumes. One Spurgeon illustration book lists the quotes by volume number and page number making it difficult to locate quotations using anything other than the original volumes. The easiest reference point is the sermon number, which will assist the reader in finding the quote no matter what format he reads. For example, if a quote is referenced as 1669.395, that quote will be found in sermon number 1669, page 395 of the original volume. Spurgeon’s ministry was broadly extended both geographically and chronologically by the fact that in the providence of God, his spoken words were transcribed almost from the very start. The first sermon in Volume One of the New Park Street Pulpit, “The Immutability of God” (delivered at age twenty), is a classic and is still well worth reading. Thus began decades of speaking and transcription yielding what is probably the largest collection of written sermons in Christian history. Spurgeon did not stop there however. By most estimates he wrote over one hundred and fifty additional books during his lifetime. Most of these have passed into antiquity, but several dozen titles remain in print today as a testimony to his enduring popularity. We have selected thirty of these which have yielded some very specific quotes and illustrations for this book. In my years of collecting and reading anything and everything I could find by and about Spurgeon, several things are obvious. First, there have not been many attempts at producing a reference quality book of extracts by Spurgeon. Second, most of those produced were deficient in a number of areas. These facts are not without good reason. The sixty-three volume sermon set occupies nearly nine feet of shelf space, and Spurgeon wrote one hundred and fifty more books in addition to all the transcribed preaching. Passmore and Alabaster, his lifelong printer, was busy day and night for decades producing millions of copies of books, booklets, and tracts; all written by one man! The result is that it takes nearly a lifetime just to read his writings, let alone catalog them. Most of the books produced until now have been either one and two line anecdotes or extended passages such as Passmore produced. One notable, recent exception is Spurgeon At His Best by Tom Carter. I have used this book since it came out in 1988. It does, however, contain edited quotes and references the sermon set but mentions no ancillary writings. Spurgeon’s lifelong printer, Passmore and Alabaster, produced several volumes of illustrations and anecdotes. I have all of these original Passmore and Alabaster releases including Flashes of Thought (1894), Feathers for Arrows (1895), and Barbed Arrows (1896). Flashes of Thought, compiled by his publisher, contains 1,000 extracts from Spurgeon’s original sermons. Feathers for Arrows is the contents of a notebook that Spurgeon carried with him to jot down thoughts and illustrations. It appears these did not all go into the sermon set. Finally, Barbed Arrows is a compilation of extracts taken from the sermon set, and interestingly, was selected by Spurgeon’s son Charles while he was laid up from an illness. All of these contain topical indexes of all the anecdotes and illustrations, but unfortunately none yield the sermon and page numbers from which they were taken. Much care has been taken to avoid duplication as I extracted material from these three books. I have several other books of Spurgeonic quotes, including one of the oldest (and still in print) by Edmond Hez Swem, called Spurgeon’s Gold; another by David Otis Fuller, called Spurgeon’s Sermon Illustrations; and, as I mentioned previously, a more recent offering by Tom Carter, called Spurgeon At His Best. One of the newest is Nuggets of Gold compiled by George Burch. They are all valuable; however, two of these have editorial changes, two lack references for further research, and one exclusively references the sixty-three volume set. I have attempted to improve on them all with this volume. Over 5,000 illustrations (more than double the previous effort of which we are aware), all original and unabridged. Two books in one, with Section One containing material of general interest and Section Two containing material of special interest to preachers, teachers, and ministry leaders. A third section with salvation illustrations and anecdotes is also included. A blend of one-liners, longer anecdotes, and extended illustrations. Most other books of quotes were only one of these formats. Whether layman or preacher of the Word, I believe you will enjoy this book and find it a helpful tool for many years to come. There is something for everyone in this book. From wise counsel to heart-warming devotional reading; from pungent illustrations to piercing rebukes; from maxims to live by to warnings to heed. P.S. The book contains 2,000 more illustrations than the website, and includes a section specifically addressed to “Ministers, Missionaries, and Mentors,” Also included is a separate section devoted to illustrations and anecdotes with an evangelistic flavor. The book will be a blessing and encouragement to all lovers of the Word of God and the Lord Jesus Christ. bring children to faith in Christ.